Epitome of elegant and comfort living! Epitome of elegant and modern living is Salarpuria Sattva Cadenza, a premier residential apartment complex coming up at Kudlu Gate, Electronic City which is one of the poshest localities of Bangalore today. On offer by the well-known builders, Salarpuria Sattva Group, the project has a total of 512 magnificent apartments of 1, 2 and 3 BHK configurations. The development is already in high demand due to its high quality construction and architectural design. 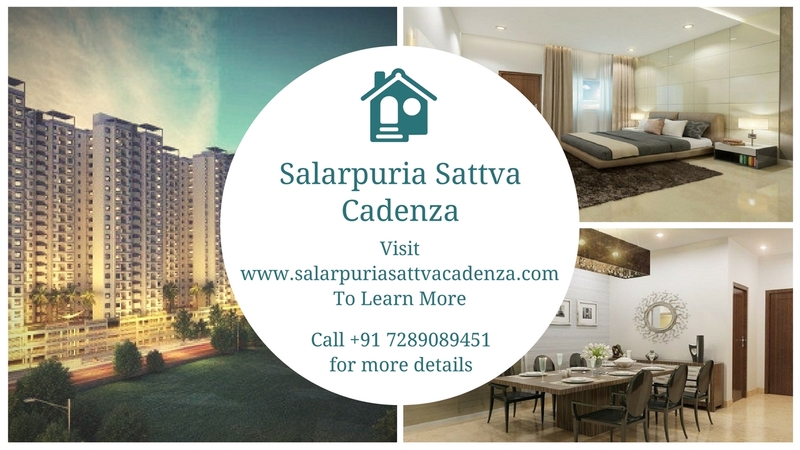 To enhance the resident’s living comfort and style at Salarpuria Cadenza are amenities like a grand clubhouse, a barbeque pit zone, a gymnasium, swimming pool, a meditation pavilion,a multi-purpose banquet hall, a local shopping store, and a library. Surrounded by 2 acres of landscaped garden (built like an infinity park) are numerous sports facilities like courts for basketball /tennis/ badminton/ volleyball, jogging tracks, and multi-activity play system for children. Inhabitants would seldom find the need to step out of this self-sufficient gated community. 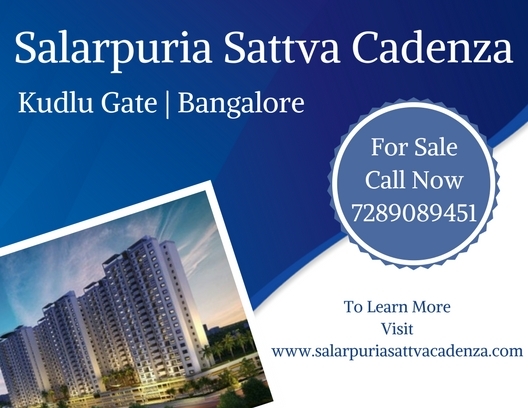 Residents of Salarpuria Sattva Cadenza Bangalore would feel the freedom of great connectivity and enjoy the advantages of living in a prime location as it is just 11 kilometers from M.G. Road and the railway station is just 15.7 kilometers away. The property has NICE Ring Road just 5 kilometers away and in close proximity are posh areas of Bangalore like Silk Board, BTM and Koramangala. Residents can easily access the Banashankari metro station (9 kilometers) and the airport (44.9 kilometers).Increasing the property’s demand is the fact that it has in close vicinity famous shopping areas, educational institutions, commercial spaces, and restaurants. Forum, Oasis and Total are some of the popular malls nearby. The entire project is spread across 6 acres of prime urban land. The apartmentsare spacious and well-planned with their sizes ranging from 714 sq. ft. to 1850 sq. ft. With a host of luxurious amenities to offer, the units have prices ranging from Rs. 48 lakhs to Rs. 1.2 crore. The Salarpuria Sattva group started in 1986 and over the last two decades risen to be one of India’s premium real estate developers. Known for their commitment, quality construction and aesthetic architecture, they have delivered high-end IT parks, residential, commercial, hospitality and retail properties. Their properties are always in demand and command a high premium. Investing here would assure high returns for your realty investment.